After yesterday’s hard work, we realized we were going to need to use every possible hour of daylight to get in our miles. Thanks to the recent “Spring Forward”, it wasn’t getting light until almost 8 am, which meant we had to do most of our morning prep in the dark. Ugh. Nikki, we need you and your obnoxiously chipper energy! We struggled to wake up at 5:30, scrambling over and around poor Britt who had carefully selected his cozy spot by the boats not realizing it would become a hive of activity in the wee hours of the morning. Unlike us, Zak, Britt and Eddie didn’t have to stuff unreasonable mileage into their day and could sleep until natural light illuminated the canyon walls. Or at least they thought they could until we arrived...mwah ha ha. We are in Boquillas Canyon proper now. 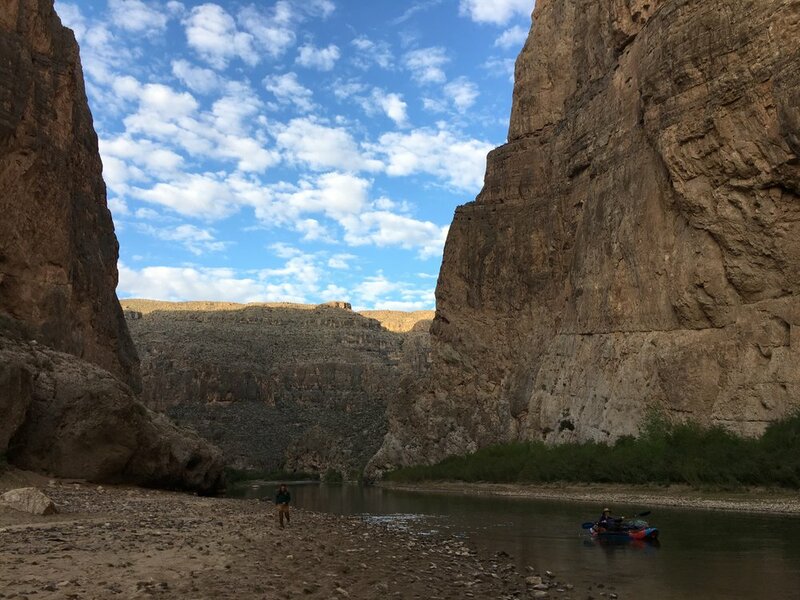 Here the Rio is designated as a Wild and Scenic River, a classification that provides legal safeguards to preserve “natural, cultural, and recreational values”. 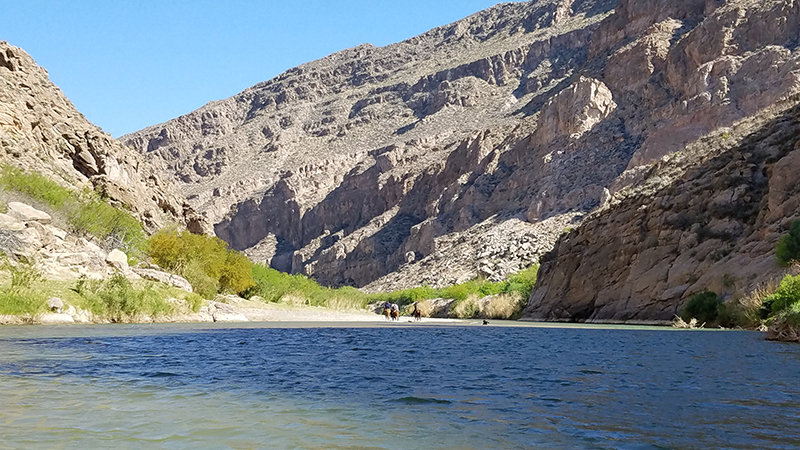 For 196 miles - from the southern tip of Big Bend NP to just short of Langtry - the river is managed by the National Park Service. One purpose of the designation is that it encourages the management of a waterway that crosses political boundaries. Definitely applicable here, where differing national policies can have great impact on a shared resource! So why walk when we could boat? Anyone with sense would take the easiest mode of transportation through this rough and tough section. The river is designed for swift passage, unobstructed by vegetation and with unbroken current advancing downstream. So why not go with the flow so to speak? Well. Walking is the backbone of this project. The slow pace brings us in touch with every detail. Everything is in your face, you touch and push through it all, you feel textures and substances. We don't want to disconnect from these sensations. That being said, we needed more help with the boats, so we decided that our hikers would rotate daily between two on the shore and one in the boat. It is an easy sacrifice to make! And...push off! The boats floated while the hikers crawled, walked, hopped, swam and jogged alongside. 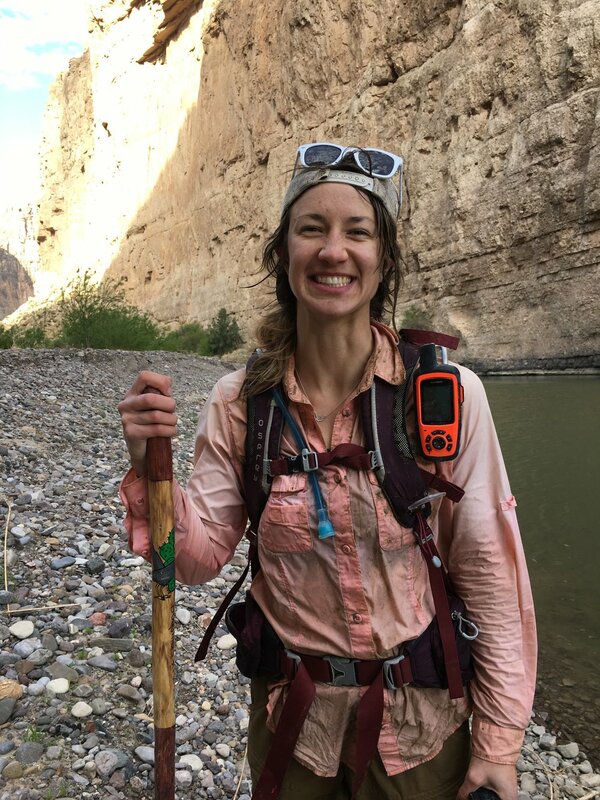 The thousand foot tall canyon walls allowed for only a narrow strip of bank; semi-consolidated sediment knotted in a thick tangle of shrubs and boulders. These banks looked deceptively easy from the river, luring us in with a low, rocky beach and leading gradually up a ramp of sand only to end in a cliff or thick wall of brush. 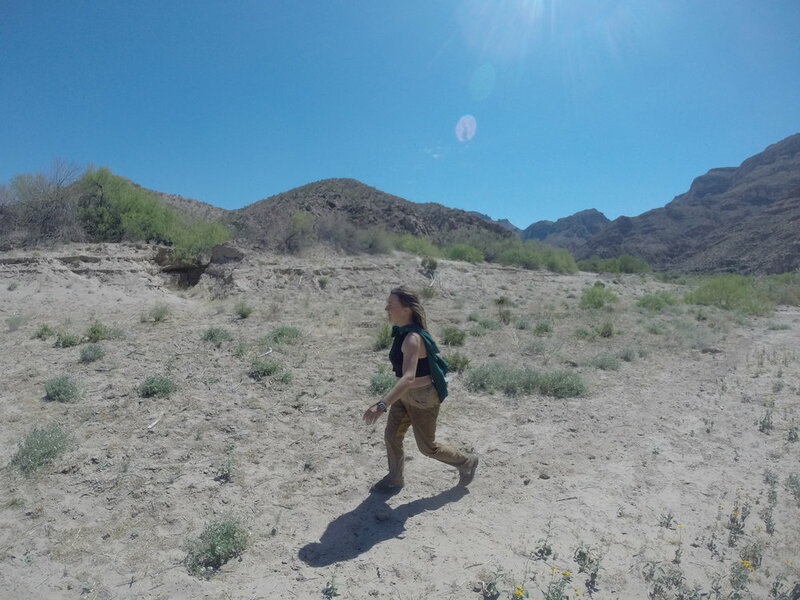 Cattle and burros overrun the land, creating small trails we were able to follow from one river bend to the next. When we couldn't conquer an obstacle we would slide down the slope and end with a splash in the water. It usually was shallow enough that we could edge our way across a gravel bar to the other side of the river. When it wasn’t, the boaters would paddle over so we could belly flop onto the duckies and catch a ride to the other side. Our reliance on the animal trails meant we alternated between the States and Mexico maybe 20-30 times throughout the day. We’ve been very deliberate about walking solely in the US so far but what is a river without both of its banks? We’ll wait to ponder these ethics in a less exhausting section. The day was full of small surprises. We passed a large group of students with a flotilla of canoes from Memphis, TN. They somehow learned Claire’s name and for the rest of the day delighted in shouting “Hi Claire!” when they passed, making her blush every time. We crossed paths with a family of five burros hanging out behind a patch of Acacia Blackbrush. Their large, wild eyes blinked sleepily at us as if people came racing down their trails all the time. We were certain no one hiked these trails but they were unimpressed. In another section, a trio of Mexican cowboys on horseback charged across the river, loping straight down the middle for some time on what we assumed was the international line. Later in the day we saw them herding a group of cattle back upstream. We were curious who owned the cattle down here, doesn’t a Wild and Scenic River mean absolutely no cattle in the riparian zone? How is this managed in conjunction with Mexico? The rapids were class II at most, but with overloaded, top-heavy boats we had to be extra careful. Kim was superwoman and hopped out at every swift bend to help line the duckies through the current, using rope to control their movement from the shore. While the boaters were preoccupied with one tricky bend, disaster struck Nikki on shore. The tall sandbank she had been inching along collapsed beneath her without warning, hurtling her straight down a vertical, 15 ft slope into the water below. The giant cloud of dust that lifted into the air was the only sign of her fall. Realizing what had happened, we raced to Nikki in the boats, worried she might be stuck, but she popped back up again, already with a grin on her face. Cheers to tough gals! By dusk, our motley crew of five was covered in river, scratches, sunburn, mud and sweat. We were exhausted and freezing and, despite our best efforts, starting to fray at the seams. Fred found a beach big enough for the boats and we got to work unloading our heavy cargo. To get out of the wind we decided to haul everything up to the top of a sandbar where we hollowed out spaces in the thick cane. We organized a human conveyor belt to move our gear up the steep wall of sand, relying on Fred’s clever system of rope, branches, and carved footholds to ascend. Snug in our nest it’s time for bed!